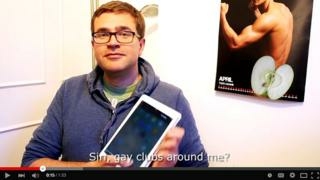 Does Russian-language Siri have a problem with gays? When a Russian speaker tried to chat to Apple's virtual assistant Siri about gay clubs, he got an unusual response - which Apple maintains was due to a bug. Alex: "Siri, gay clubs around me? Siri: "I would have turned red (blushed) if I could." Alex: "How to register a gay marriage in the UK?" Siri: "I will pretend I haven't heard it." Apple says Siri's responses were the result of a bug that has since been fixed. But the online discussion in English reflected the fact that gay rights and homophobia in Russia are now an issue very much discussed in the outside world. There was an assumption that Siri had been deliberately set up this way to comply with Russian law. "Apple is required to conform to the law of the land in order to sell devices in a place. Recognizing that is realism, not cynicism," said one Reddit user. Comments in Russian were much more angry in tone - some homophobic and others questioning Western interest in the subject. Alex, who's originally from Russia but now lives in the UK, told BBC Trending that he discovered Russian Siri's "attitude" by accident. "I was out with friends who'd updated their phones to the latest version of iOS," he said. "Russian Siri was one of the new features available. So we made queries using the word 'gay' and got very weird replies. We also got similar responses with the word 'lesbian'," he says. A BBC Russian team asked Siri similar questions and got the same response. You can read their article about it (in Russian) here. Gay rights are a contentious subject in Russia, after a law banning gay "propaganda" was passed in 2013. It prohibits people from giving information about homosexuality to those under 18. If you like stories like this from BBC Trending, take a second to vote for us - we've been nominated for a Webby Award. Next story: Is it wrong to call someone "plus-sized"? You can follow us on Twitter @BBCtrending, and find us on Facebook.